It’s time to forget the ordinary luxury and sports cars as none of the vehicles offers as much luxury and style as does Toyota Land Cruiser Prado 2014. For over a decade, the magnificent Cruiser has been the symbol of class, status, superiority and honor for the one who possesses it. Professional elite in the country who don’t like sports cars but love performance and masculinity give preference to this SUV over all other automobiles of the genre. The enhanced design and appealing specifications of this bold and energetic machine make it the most liked and highly popular vehicle across the country. Commonly referred to as Land Cruiser or simply Prado, the ‘sports utility vehicle’ (SUV) has been up for sales since 1984 and has caught immense attention of the potential buyers worldwide. Toyota Prado 2014 is an absolute delight for car fanatics as it is the strongest and most powerful model ever built by the Japanese company. During its ceremonial launch, the company officials announced that the vehicle will be made available at all major Toyota centers all over the world, and the advance booking of this magnificent vehicle is already underway. With all new features and a redefined body design, the latest release is all set to be the most successful model that is sure to beat all the records set by the Toyota Prado 2002, which has been considered as the most excellent one till now. The latest release of Prado comes with as many as ten super versions, but the most popular of these are just three, namely, VX Turbo-EFI, GX Turbo-EFI, and VX-A/T (Petrol). Walking on the steps of its stylish predecessor, with reasonable Toyota Prado 2014 price the bold exterior of this vehicle gives the general impression of the strength and space it possesses. The stylish and unique combination of body colored bumpers, rearview mirrors, tall yet bold stature emanating from the audacious headlamps and taillights, and chrome wheels not only gives it a cool and a stylish look but also imparts an aggressive attitude. The already charming backside view of the marvelous Cruiser is further embellished with the ‘back door glass hatch’. The brave-looking head and sharp fog lamps, with the combination of indicators fitted inside, make the front of this SUV look grand and gorgeous as you can see in the Toyota Prado pictures. The interior of this postmodern technological marvel is as much appealing as its exterior. 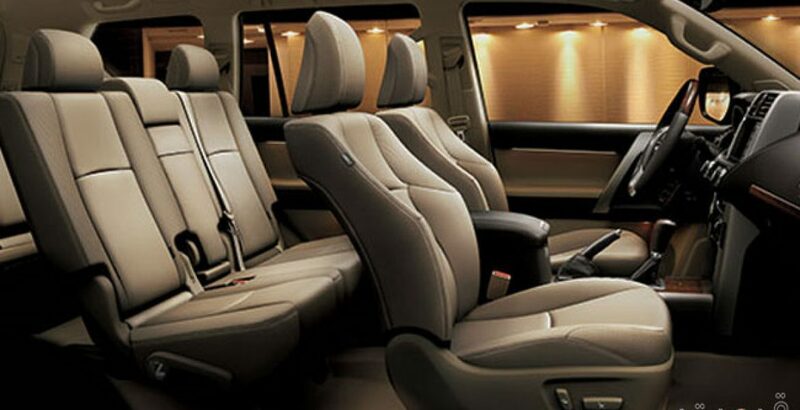 Being comfortable and spacious in every dimension, the family vehicle can easily accommodate seven adults in its extremely comfortable and embellished interior. The seats are not only wide and comfortable, but there is enough space between them. Behind the second row of seats, there is an empty space reserved for your luggage, but you can also order for a seat to accommodate more people when you buy it. The automatic anti-glare rear view mirror is attached with interior of the roof just over the instrument panel that facilitates the driver to ensure safety on the road. The glaring rearview mirrors, as found in ordinary automotive vehicles, reflect maximum amount of light and cause difficulty for the driver in viewing the approaching traffic, hence increasing the chances of an accident. 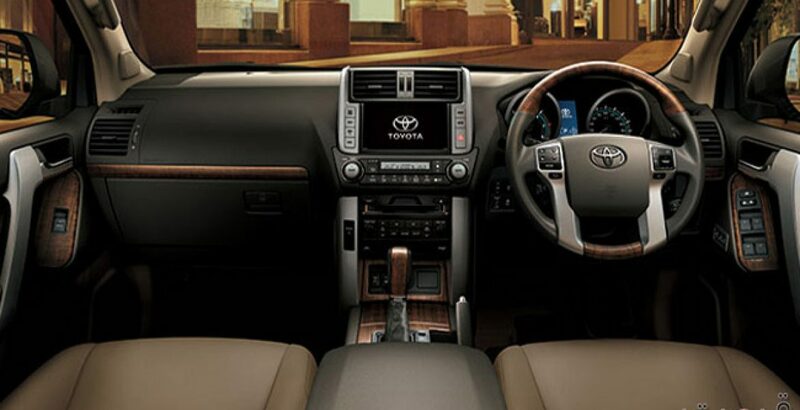 The highly efficient and fully automatic air conditioning system is one of the most appealing Toyota Prado specs as it is also furnished with dial-type controls and offers you 3-zone independent temperature adjustment. The three zones for independent temperature adjustment, in the vehicle, are located close to the front passenger’s seat, driver’s seat, and rear seats. For the exclusive entertainment of the travelers going on a long journey, the advanced multi-media system also contains the option of external audio input through an audio mini-jack as well as a USB interface. 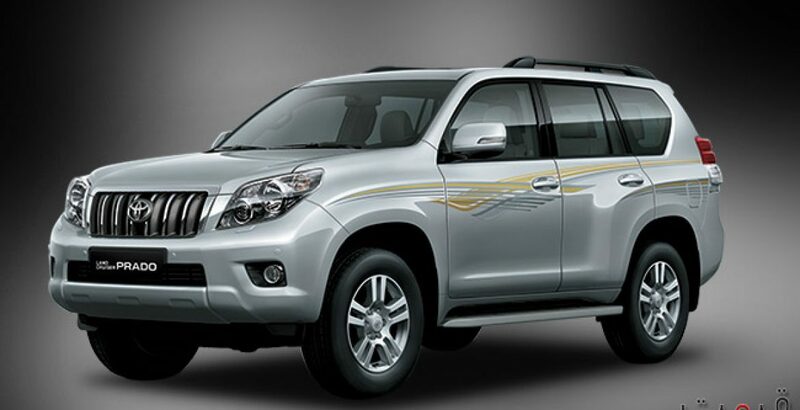 Different models contain mainly two types of engines with varying Land Cruiser specs, viz. IKD-FTV 3.0L diesel engine and 2TR-FE 2.7L gasoline engine. Here it is very important to note that the transmission type in VX version is 6-speed automatic, while in the GX Turbo version, it has 5 levels of speed to be operated manually. However, the 5-speed manual version is featured with super-intelligent electronically controlled (ECT) transmission. 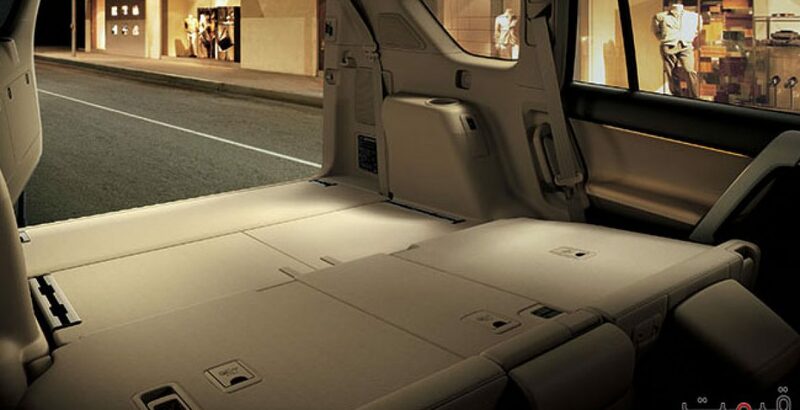 The whooping displacement capacity of up to 4,608 cc makes your precious possession a super-power vehicle. Based on the latest technology, the world’s largest auto manufacturing company has introduced many advanced security and safety features in the motorcar that ensure supreme level of protection on the dangerous roads with heavy traffic. Firstly, the adaptive front lighting system is accompanied by high-intensity discharge lamps that increase the visibility on the road. In addition to all these, the vehicle is also furnished with the postmodern safety systems, like pedestrian protection, ‘vehicle stability control’, crash safety, active headrests, and so on. Indus Motor Company Pakistan has also introduced Movement Tracking System (MTS) in the latest model that allows the driver to set the type of road they are driving. For example, if you are driving on a rocky terrain, you need to set it to “rock”, and the system will shift the vehicle to rocky mode for minimizing the risk of wheel lockup. With all these superb and mind-blowing features, the interested individuals must be expecting a considerably high Toyota Prado price in Pakistan. Depending on the specs of a particular version, the value of price tag varies accordingly that might be as low as eleven million with the other extreme reaching over twenty-three million PKR.